The National Young Farmers Coalition helps elucidate the state of US agriculture by inviting young farmers to share their personal stories of what it’s like to engage in this aging industry. What does it mean for a 10,000 year old practice to age? How can a process that sustains all humans age? The average age of the American farmer is 58, and most people are being replaced by new technology. The human element is aging. If we want to keep jobs, transparency, accountability, and environmental stewardship, we need young farmers. Today kicks off the 7th NYFC blog series: Heart and Grain. Three young grain farmers from across the country will broadcast their wins and woes through monthly blog posts on different topics. The first set of posts are up, so you can get to know these farmers in Wisconsin, Minnesota, and, well, the last isn’t such a stranger to you: me! I’m very excited to participate as a way to contribute to this body of knowledge about grain growing, to (hopefully) inspire young farmers to grow grain, and to learn from the others. SO EX CI TED! 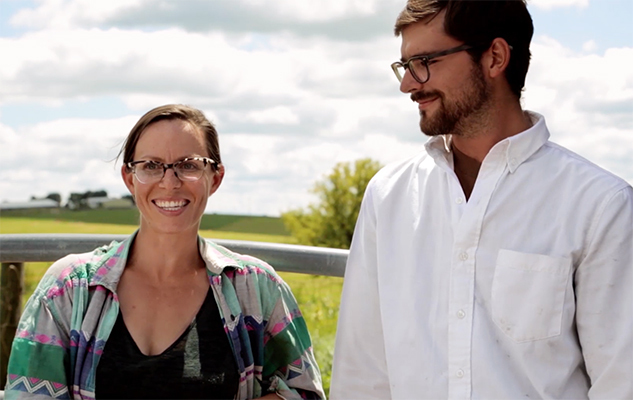 The first video focus is on Meadowlark Farm’s Halee and John Wepking and how they’re introducing ecologically-mindful practices to a farm partnership in Wisconsin. You can read about them and watch their video by clicking on their photo.